The mathematical notion that any periodic function, no matter how jagged or irregular, can be represented as a sum of sines — called a Fourier series — is one of the most extraordinarily useful ideas ever. Ever! It is responsible for the theory of transmitting and recovering information, and yes, is ubiquitious in geophysics. 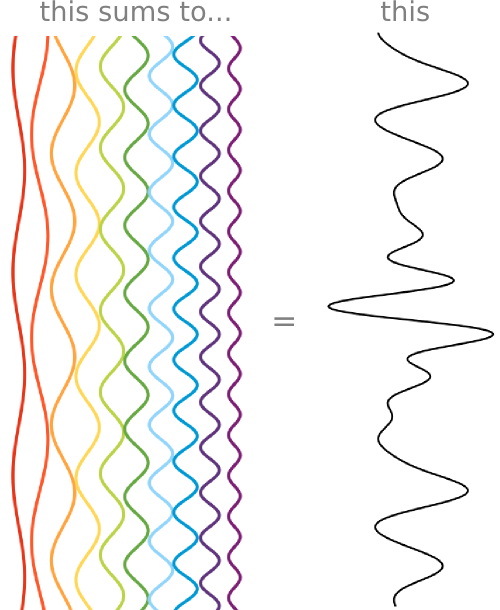 Strikingly, any signal can be decomposed into an ensemble of sine waves. They are two different representations of the same object, two equal representations of the same information. Fourier analysis is this act of sending waves through a mathematical prism, breaking up a function into the frequencies that compose it. To build an arbitrary signal, the trick is to mulitply each of the sines by a coefficient (to change thier amplitude) and to shift them so that they either add together or cancel (changing the phase). From the respective coefficients and phases of the composite sinusoids, one can reconstruct the original curve: no information is lost in translating from one state to the other. So the wiggle trace we plot of the seismic waveform has bits of information partitioned across each of its individual sinusoids. The more frequencies it has, the more information carrying capacity it has. Think of it as being able to paint with a full color palette. The degree of richess or range is known as bandwidth. In making this example, I was surprised how few sine waves (only ten) it took to make a signal that actually looks like a bonafide seismic trace. In 52 Things You Should Know About Geophysics, Mostafa Nagizadeh wrote an essay on the magic of Fourier; it's applications for geophysics data analysis. And he should know. In tomorrow's post, I will elaborate on the practical and economical issues we encounter making discrete measurements of continuous (analog) phenomena. Here is a Google spreadsheet where I contructed this signal. You can play with the amplitudes, frequencies, and phases to make your very own signal. Try it out. Change a few values in green and watch what happens. Make some small changes, makes some big changes and see how sensitive the summation is on individual components.